Wanderer’s Inn is open year-round, advance reservations are highly recommended. We have a courtesy phone at the back door, so you can call when you arrive and someone will be over quickly to check you in! Quiet hours: 11PM to 7AM. You will have a building key so you can come and go anytime, we just ask you be considerate of other guests that may be sleeping in your room. Please note that due to limited space, the dorms are co-ed. All rooms are equipped with one locker per guest. Padlocks are provided free of charge. Bedding is not provided; please bring your sleeping bag or hostel sheet. Bedding can be rented for $5/bed. Full Facility Rental is available for groups, families, teams, special events, and courses. Please contact us for details and to discuss rates. 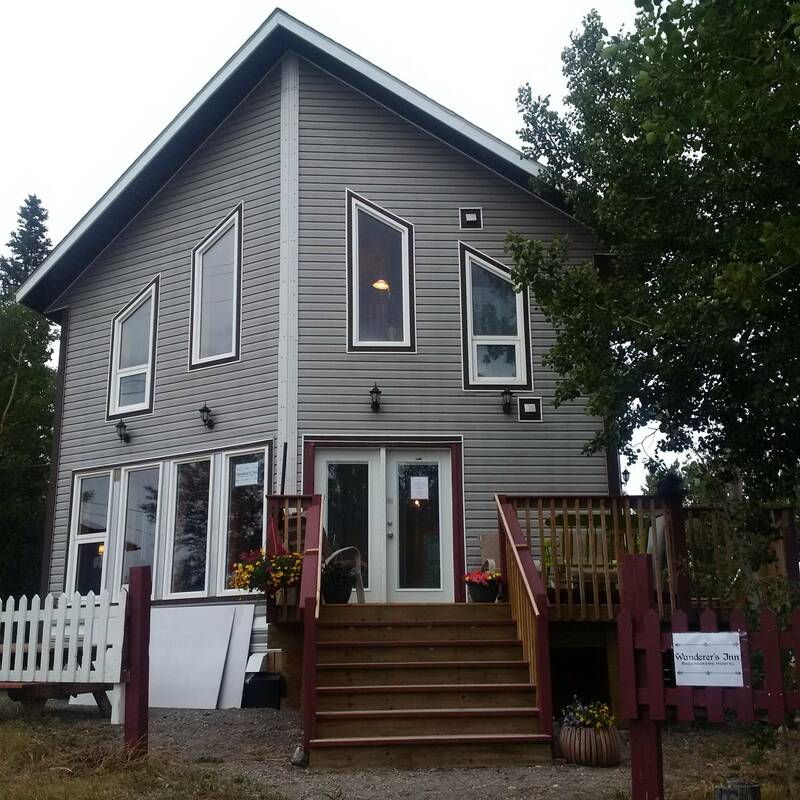 We are conveniently located in the center of the Village, one block from the St. Elias Convention Centre, the Hockey Arena, Curling Rink, School, and all other amenities. In the winter we have 10 bunks, in the summer we have 14 bunks plus tent pads. Facility maximum: 20 people at any time (floor space or additional tenting on property as available). Meeting Space for groups, presentations, or course instruction is available for rent in our hostel dining room (Suitable for 8 people around the table, and 15 people lecture-style). Discounts are available for multi-day rental or non-profit groups. Meeting space: $25/h, up to a max of $150/day. Wifi, coffee, tea and water are complimentary (self-serve) with meeting space rental. Projector and screen use: $10/day. Meal or refreshment catering for your meeting can be arranged for a $10 fee. Contact us for professional catering options and rates. Showers (for non-hostel guests) are available at $5/person. Priority is for hostel guests. Towel rental: $2/person.